Click here to download the trainer. After the download is completed, just launch your game and the trainer. Wait a few seconds and the trainer should attach to the game. Please respect the required version of the game. 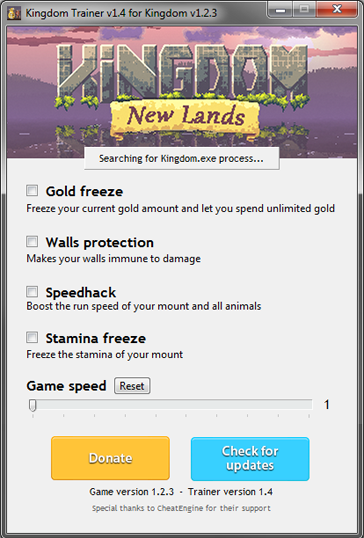 PASSWORD FOR DOWNLOAD LINK : "cheat"
04/22/17 Trainer 1.4 Game 1.2.3 New build with new functions, all working with Kingdom : new lands 1.2.3. 04/15/16 Trainer 1.3 Game 1.2.0 Updated to work with the last version of the game. 01/02/16 Trainer 1.2 Game 1.1.0 Updated to work with the last version of the game and infinite stamina has been replaced by Game speed function. 11/09/15 Trainer 1.1 Game 1.03 Updated to work with the last version of the game. 10/28/15 Trainer 1.0 Game 1.01 Initial release with : Gold dupe, Walls protection, Infinite stamina. 08/30/16 Trainer 1.0 Game 1.001 Initial release with : Boost level/EXP/HP/AT/DF/Gold and Game speed function. 08/21/16 Trainer 1.0 Game 1.55 Initial release with : Disabling credits check & deduction and disable trace detection.